Summer – Hello Korea ! It’s been beautiful, beautiful weather the last two days. Like summer in Seattle. So spring here is like summer in Washington State. I hear it doesn’t last long, unfortunately. Note the rattan bolster? You can still buy these – saw them at E-mart and wondered what it was and why it was in the bedding department. Now that I know what it is, I think it’s genius. 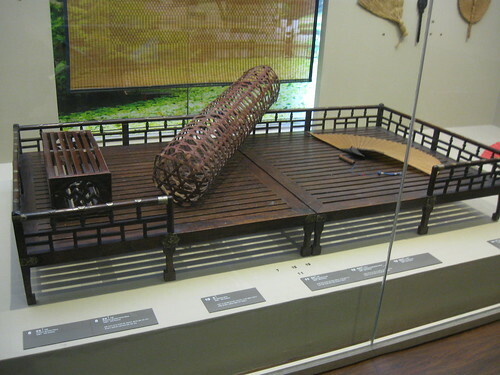 Was at the bookstore and flipping through a book on Hanock, and saw a picture of the rattan bolster. I can’t remember the name of it, but it’s Korean translation was, “second wife.” Better to cuddle with in the hot, humid summer time. Koreans are really funny. Never in a satirical way. But slap stick, baudy, or raw way. Wait… what is a bolster? What do you do with it and how does it keep you cool? “A bolster (etymology: Middle English, derived from Old English, and before that the Germanic word bulgstraz) is a long narrow pillow or cushion filled with cotton, down, or fibre. In western countries, it is usually placed at the head of bed and functions as head or back support. In southeast Asian countries, in particular Philippines, Indonesia, Malaysia, Singapore, and Thailand, the bolster is designed to be hugged when sleeping. It is called a dakimakura in Japanese. In the Philippines, many call it the “hotdog pillow” (or more natively, “tandayan”) following the close resemblance to the food bearing that name. In Chinese, its hanyu pinyin is “bao zhen” (lit. “hugging pillow”). In cantonese, it is called “Lam Chim”. The Indonesian/Malay folks called it “bantal peluk” or “bantal guling”. Tradition suggests that a wife would fashion the bolster out of bamboo and give it to her husband when he travelled away from home so that he would not be lonely at night, hence the name “bamboo wife,” or “Dutch wife,” or chikufujin in Japanese. I only knew what a bolster was from the travel trailer we had when I was a kid. Instead of a headboard, each sleeping area had a bolster. It was a long stuffed firm cushion that ran the width of the bed. And it was used as a backrest or as a body pillow. Bolsters are usually round or square in cross section, and firm – keeping their shape – unlike a normal, floppy pillow. Because I spent some time looking up the name myself at one point, it’s called a 죽부인 in Korean. I might have to get one myself. Everybody needs a wife, right? Jook boo een is right! The only 주 that I was familiar with comes from the verb 주다 (to die), so I spent some time flipping through my cell phone dictionary today to see what else shows up. Looks like it’s also used to describe a few different things made from bamboo and comes from the Chinese characters 竹夫人. (Bamboo Lover/Spouse Person) Of course, now that I learned some new information I want to write about it on my own site. haha. Maybe if I buy one for myself I can show it to my students and they won’t ask me about finding a wife anymore?